We had a great day out in the sun installing non-combustible insulation, fire resistant membrane and timber battens to this new build property ready for us to thatch. When we work on new builds it’s easy to go through the process of what should be there when it comes to a thatched roof. It’s like having a checklist, a step-by-step. The importance of having the correct fire-resistant materials under your thatch is high and it is common sense to ensure your property’s roof is fireproof. 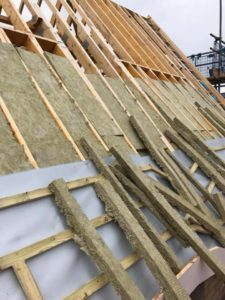 Working on the not so new builds we still ensure your home is safe, this means that we do not just re-thatch your roof, we ensure that the underlying materials are still in good working condition. 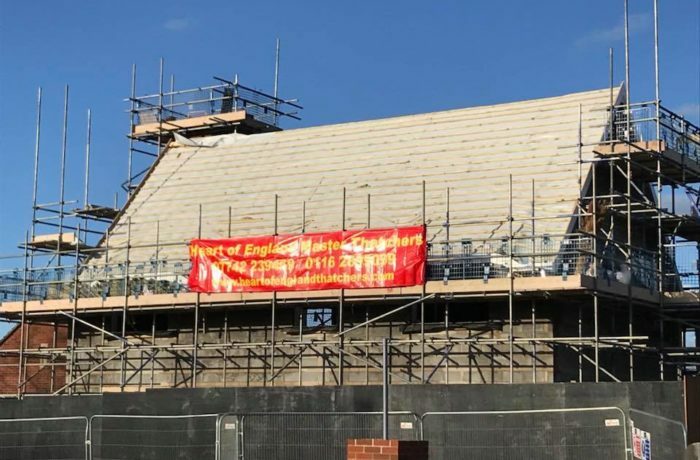 Here at Heart of England Master Thatchers, we take our craft seriously, there isn’t much point in spending your money on a full roof re-thatch without having the correct safety materials in place, as the worst could happen! There are many factors that could potentially lead to a thatch fire, one is not having the correct fire-resistant materials in place. Another factor being your chimney and it’s one of the most common causes of thatch fire. Thatch fire safety is highly important which is why we ensure your home is safe. Chimney Heat Monitors and Alarms – To warn you when your chimney becomes unsafe. Non-Combustible Insulation – Insulation is important in every home, making sure this won’t contribute to a fire is important. Fire Resistant Membrane – Any material that says ‘fire resistant’ is helpful when fireproofing a property. Fire Barriers – Making sure if a fire did start, where would it be able to stop. Alarms – At least you should have a fire alarm to warn of any house fire, thatched or not! If you would like us to take a look at your thatched property or need a thatching service, please get in touch with our team today.